Previously, MSI teased its upcoming Z97 overclocking motherboards featuring a Delid Die Guard and OC Engine. Recently, the MSI Z97 MPOWER MAX motherboard was revealed, giving us a better look at the board, its features and specifications. 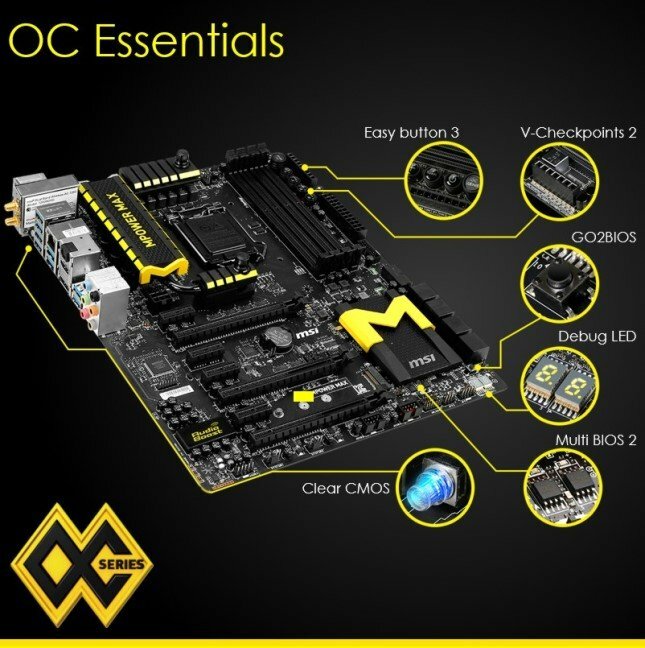 Check out the “OC Essentials” of the Z97 MPOWER MAX below and tell me what you think of this board. The MSI Z97 MPOWER MAX, features an LGA socket 1150 supporting 4th Gen Intel Haswell, Haswell Refresh, Devil’s Canyon and 5th Gen Broadwell processors. It might also feature a 20 Phase DigiALL Power Design (although I’m not sure about this yet), but the heatsink that is cooling the MOSFETs, Super Ferrite Choke (SFC) and other capacitors, is water-cooling ready. I can’t confirm yet whether it draws its power from two 8Pin power connector or 8+4 Pin power for its CPU, since the other 8Pin power is near the PCIE slots already. Probably the other 8Pin is for Multi-GPU configuration. This Z97 motherboard features 4x DDR3 DIMM slots which will most likely support memory speeds of up to 3000+MHz (OC). It has “Easy Button 3” composed of a power button, reset, OC switch, a Plus and Minus buttons. There is also the V-Checkpoints 2 for system and voltage monitoring, and a Clear CMOS button located at the rear I/O panel. The MSI Z97 MPOWER MAX features 2 BIOS chips (Multi BIOS 2), a GO2BIOS button and a Debug LED located at the lower portion of the board. There are 8x SATA 6GBps ports, it doesn’t seem to have any SATA Express port, but it has an M.2 PCIE port for NGFF SSD which should be sufficient enough if you are planning to use a high speed / high performance NGFF SSD. Looking at the lower portion of the MSI Z97 MPOWER MAX, it has 3x PCIE 3.0 x16 slots supporting 3-Way SLI and CrossFire multi-GPU configurations, and 4x PCIE 3.0 x1 slots for add-in cards. It also features Audio Boost audio core with EMI Shielding. There is a LED path coming from the rear audio ports down to the audio core, separating the audio components from the rest of the components. The board also has a built-in WiFi component located at the rear I/O panel, and probably it has Bluetooth 4.0 as well. The picture above doesn’t show the Delid Die Guard lock, probably it’s a separate peace of tool included in its accessories. So far that’s all I can tell about this board. I’m still looking for an image of the Z97 XPOWER AC, hopefully it will be as interesting as the MPOWER MAX. The MSI Z97 MPOWER MAX is expected to be officially launched on May 10 (or after), hopefully together with XPOWER AC, and the rest of the Z97 lineup. More MSI motherboards based on Intel 9 Series chipset will be revealed in the following months after.